The aircraft was on a scheduled freight service from Darwin via Tindal, Alice Springs, and Adelaide to Sydney. The flight from Darwin to Tindal was apparently normal, and the aircraft departed Tindal slightly ahead of schedule at 18:34 CST. On descent into Alice Springs, the crew advised on the MTAF frequency its intention to conduct a twin locator (Locator/NDB) approach to runway 12. The Locator/NDB approach at Alice Springs involves an outbound track of 292 degrees M from the Alice Springs NDB, overhead the Temple Bar Locator to the turn point at the Simpsons Gap Locator. The initial approach altitude is 5,000 ft and the intermediate altitude at Simpsons Gap is 4,300 ft. The inbound track is 112 degrees. The aircraft tracked directly to the Simpsons Gap Locator, arriving there at about 4,300 ft. After passing the Simpsons Gap Locator, the aircraft continued to the Temple Bar Locator, arriving there at about 3,500 ft. Beyond this point, the aircraft continued to track approximately 112 degrees M and descended to 2,300 ft, where it leveled briefly before climbing slightly immediately before impact. The aircraft struck the top of the Ilparpa Range at 2250 feet. 1. There were difficulties in the cockpit relationship between the pilot in command and the co-pilot. 2. The level of crew resource management demonstrated by both crew members during the flight was low. 3. 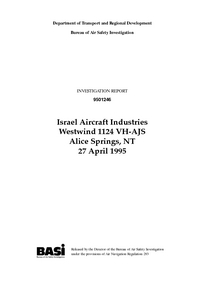 The Alice Springs locator/NDB approach was unique. 4. The briefing for the approach conducted by the pilot in command was not adequate. 5. When asked for the 'minima' by the pilot in command, the co-pilot called, and the pilot in command accepted, an incorrect minimum altitude for the aircraft category and for the segment of the approach. 6. The technique employed by the pilot in command in flying the approach involved a high cockpit workload. 7. The crew did not use the radio altimeter during the approach. Distance from Katherine-Tindal Airport, NT to Alice Springs Airport, NT as the crow flies is 1041 km (650 miles).